"Would You Like To Grab Your Visitors By The Ears, Dazzle Them With Professional Quality Streaming Web Audio That Makes An Impact, And Watch Your Profits Soar? 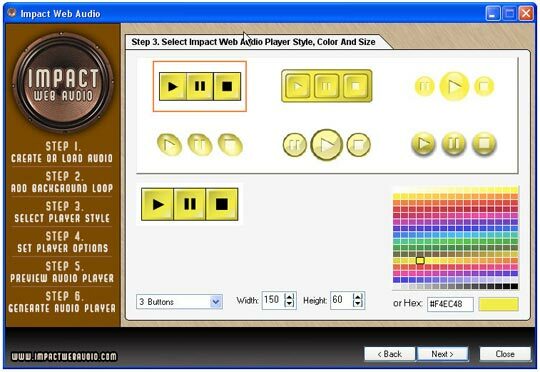 You Can Do It, In Just A Few Minutes - With Impact Web Audio!" 12 Professional Background Loops - The background audio loops included with Impact Web Audio were designed by the Internet's audio marketing expert, Mike Stewart! When it comes to marketing online with audio, there's absolutely no one better than "The Internet Audio Guy". 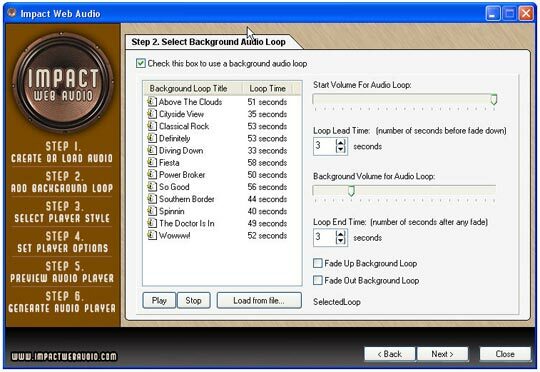 Step two allows you to choose one of the 12 pre-loaded background loops that will be used to enhance your voice-based audio track. Each of the background audio loops was created specifically for online marketing by one of the Internet's most respected audio marketing experts, Mike Stewart. What if I told you that you could download, and start adding profit-pulling, streaming web audio players to your website in just minutes for less than $50? Would that be fair? Well, I'm going to do even better than that! You're not going to pay $50, you're not going to pay $40, or even $30 ... 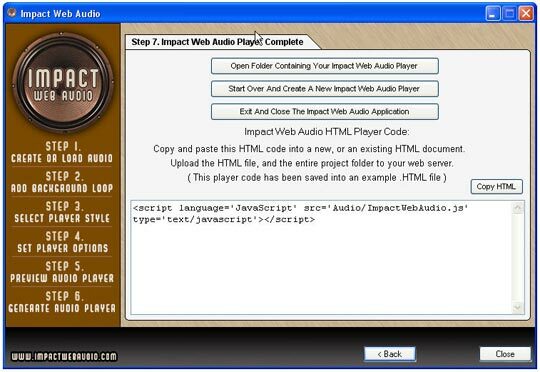 If you order right now, you can download your copy of Impact Web Audio for only $12.95! 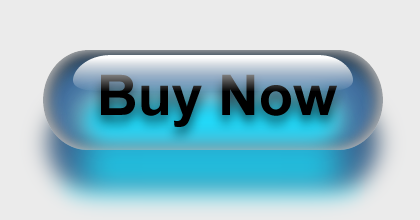 For the low price of only $12.95 you’ll receive this powerful, feature-packed software that allows you to virtually grab your visitors by the ears, and force them to pay attention to your most important marketing messages! 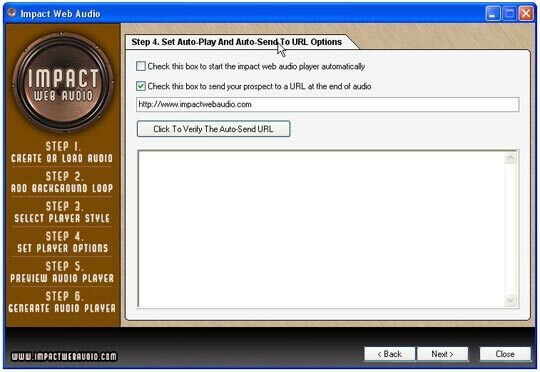 You'll be creating professional streaming web audio players that could dramatically increase your conversion rates in just minutes. You'd normally expect software with such a robust set of features to cost you three or four times as much, and that doesn't even take into account the monthly fees you'll save. 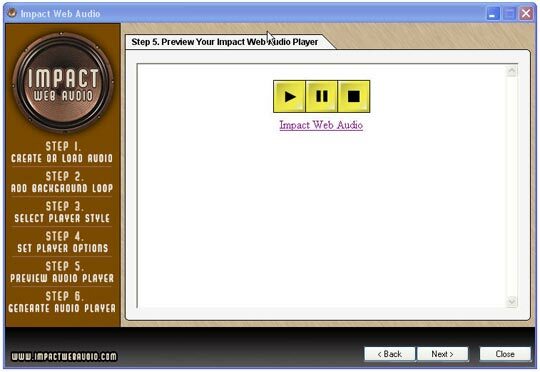 But, with Impact Web Audio there are no hidden fees, no monthly fees, and nothing else you ever have to buy. 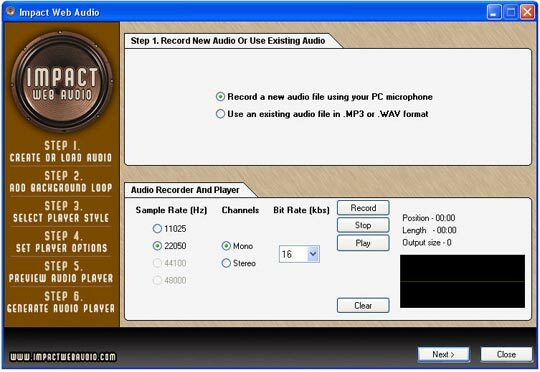 For the one-time low price of only $12.95 you in complete control of creating your own high-impact, streaming audio players. 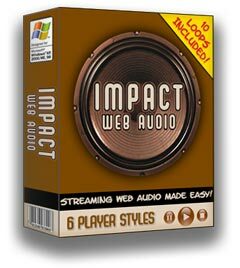 Order Impact Web Audio right now at the incredibly low price of only $12.95 and you'll be making an impact where it matters the most ... your bottom line!